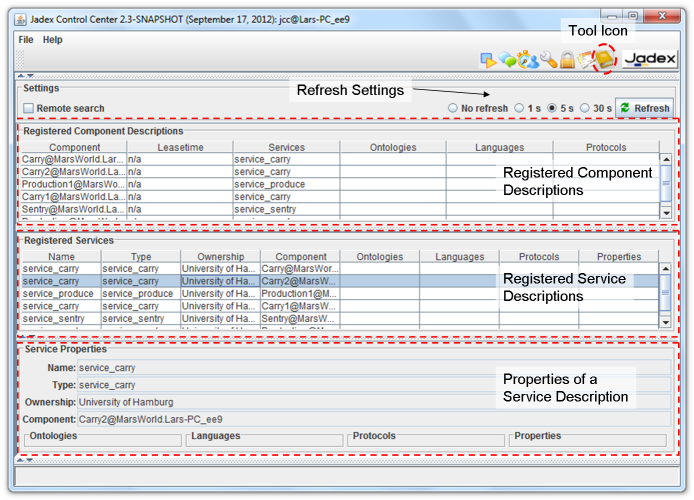 The diectory facilitator tool can be used to inspect the component and service registrations done at the directory service (DF) of a platform. Please note that using Jadex V2 the directory facilitator is not used any more as default for service registrations, i.e. you won't find any service of an active component registered at the DF. But as there are still some (older) example applications such as Marsworld using the DF the corresponding GUI tool is still supported. It basically offers a tripartile view. In the topmost list called Registered Component Descriptions, all currently regsitered component descriptions are shown. Each component is allowed to only register exactly one component description that may contain an arbitrary number of service descriptions. These service descriptions are depicted in the list below called Registered Services. In the view at the bottom the details of one sepcific service description are displayed. The idea is that you can first select an interesting component description at the top and then select one of the contained service descriptions, which are subsequentlich shown with all aspects below. The tool also allows to remove a component registration by using the corresponding list, selecting an entry and chosing the Remove component action from the popup menu.